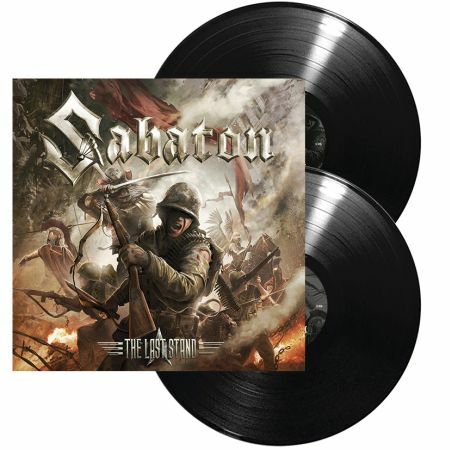 SABATON - THE LAST STAND VINYL (2LP BLACK) | Online Shop | Wizard LTD. Album: "THE LAST STAND VINYL (2LP BLACK)"
If you have any doubts, please update your books now: our favourite Swedish war machine SABATON are on their way to the absolute top of the heavy metal world. Need some evidence? As we speak, these platinum selling, Falun-based heavy metal heroes are headlining some of the biggest European festivals through fires and flames and playing massive stadium concerts in front of tens of thousands of enthusiastic fans with legendary comrades, such as IRON MAIDEN and SCORPIONS. In August, SABATON will once again command the troops on the holy grounds of Rockstad Falun Festival - aka Sabaton Open Air - when the band hosts their own three day festival - closing the last day with an explosive performance. Then, later this year, SABATON&apos;s sight will be directed at the USA, where the band is a doing huge tour and also performing at Ozzfest Meets Knotfest Festival in California, alongside BLACK SABBATH, SLIPKNOT and others. However, this is just the beginning: when the winter arrives, SABATON will unleash their prestigious live power upon the whole of Europe. No mercy will be given and all guns will be blazing, when this tireless killing machine will blow out sold-out arenas to another dimension. During this tour, named »The Last Tour«, SABATON&apos;s support comes from German metal legend ACCEPT. What? The last tour of SABATON? No, not really, as the band&apos;s worldwide war plans are already marching years ahead. The title of this massive, to say the least, world tour comes from SABATON’s latest masterpiece »The Last Stand«. The new record, which will be unleashed to the masses in August by the world&apos;s most powerful heavy metal label Nuclear Blast Records, is simply a perfect addition to SABATON&apos;s discography, which already contains some of the most heroic heavy metal known to man. SABATON have reached their unshaken position as heavy metal&apos;s AAA-torchbearer after releasing ingenious studio recordings and playing endless amount of unforgettable live shows. »The Last Stand« is another unquestionable and bulletproof evidence of SABATON&apos;s top class abilities and it will be followed by the band&apos;s most gigantic world tour to date. What can we say? Good times ahead, indeed!